three times — performing triple trips before they repeat! Ian Holmes, from Princeton, Minnesota, is progressing nicely on his Purespring Watercress Tram, modeled after English narrow gauge farming railways. The Gn15 track plan, measuring 30×16 inches (750×400 mm) is a simple oval of track with one siding. 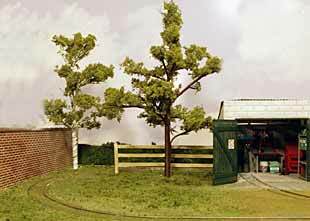 Ian’s scenery is particularly effective, and his operating plan will make the little line lots of fun to run. 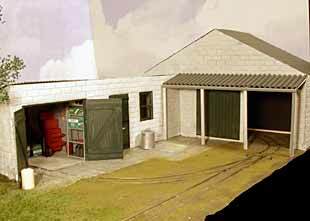 Notice the detailing of the workshop inside the shed! For more photos and information, visit Ian’s website. Chris Schmuck, who lives in Warren, Ohio, has resurrected a 3×2 foot On30 layout that he started buildling six years ago. Somehow it got shunted aside in favor of a large N-scale pike, and was stored in his shed for most of that time. Recently, influenced perhaps by this web site, Chris got the little pike out again (at right). Due to wear and tear, he has now started a rebuild, again handlaying his track with four spikes per tie (at left). Chris plans to use the Bachmann On30 Davenport loco with extra detailing along with a bunch of Bachmann dump cars. He’ll build an ore loader at the top and a small stamp mill at the bottom of the hill, and run the pike as a busy mining line. The track plan follows the excellent Cecile Mining Co. design originally described by Fred Hamilton in the October 1979 issue of Model Railroader magazine. Up in Halifax, Nova Scotia, Jim Jones is also building an On30 line using the versatile Bachmann Davenport loco. Construction was held up for nearly a year as Jim unsuccessfully tried to buy or build a small wagon turntable for the industrial line. Then he accidentally stumbled upon the small Kibri turntable shown here … it’s inexpensive, about 12 cm in diameter (4.75 in), and it’s listed in Walthers catalog so should be readily available. Jim used Peco O narrow-gauge trackage (HO gauged rails with larger, O scale ties/sleepers) and finds he can smoothly switch wagons onto the turntable (after a little shimming). The layout is 29×18 in (736×450 mm) and is based on a sketch made by Peter Mesheau back in the 1980’s. Jim plans to begin exhibiting it as soon as he’s installed some scenery. Three-year-old Cooper Pettit, from Sydney, Australia, drives yet another Bachmann Davenport for a test run on the circular layout a-building by his father, Steve. A gold medal goes to Steve for his nerves of steel, allowing operation at such great heights with no safety net! The little line, called Bad Altitude Moonshine, measures 3×2 feet and will be taken around to exhibitions in Oz when it’s finished. Steve’s building it as a “time out” from his On3 freelance west coast logging line. Stay tuned for more pictures as things develop! The Thrill of Three Times Around! TRRRIPLER 1: NOT A TANGENT IN SIGHT! 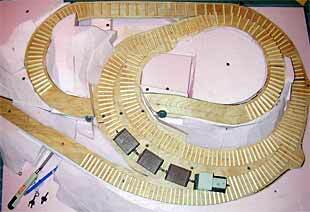 Jonathan Scott, a transplanted Aussie currently living in Santa Rosa, California, discovered that he could make an elegant three-times-around circuit using standard Peco N-scale 9″ and 10″ radius curved track sections (left photo). There’s not an inch (or a centimeter) of straight track in this Pizza Hill layout, which measures 24×24 in (600×600 mm)! In the right hand photo, you can see the way Jonathon has developed a landscape that sets off the intricate track plan. Not shown in the photo is the subway (underground) station he built in at the rear of the layout. 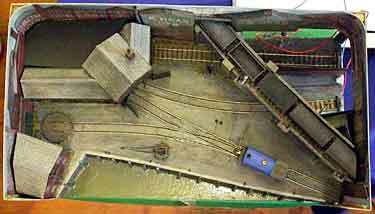 To see the “tube” and other shots of the layout, as well as a track plan, visit Jonathan’s web site. TRRRIPLER 2: IT’S A TOUGH CLIMB TO THE TOP! A different but equally intricate design was dreamed up by Don Coker, from Columbus, Georgia. 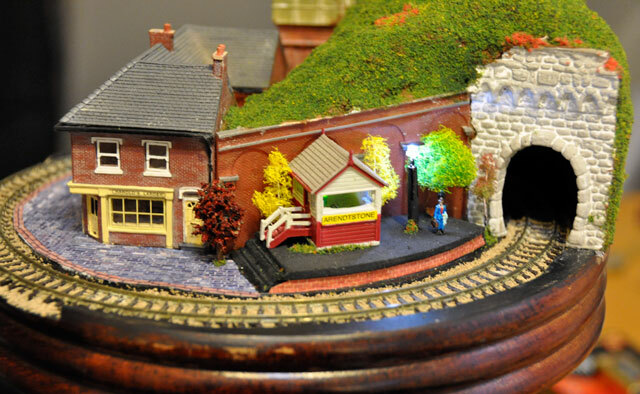 Don’s 4×4 foot (120×120 cm) layout features a pair of long N-scale trains, each headed by several diesel road engines. At the start of operations, one train is hidden in the tunnel at the top of the plan, just before the portal leading to the visible trackage labelled “Ground Level”. The other train is in plain sight on the Ground Level track, and starts its tortuous hill climb by entering the tunnel at the lower right (by the arrow). Follow the train’s progress up the hill, disappearing and reappearing as it struggles through a series of tunnels, moving ever higher. Sound effects would be very helpful here, to show off the growling power of the locos. Finally, the train reaches the mountain top and disappears on to the descending helix. As the top train begins its concealed descent, the second train moves out onto the Ground Level track, ready to start another dramatic ascent of the steep climb. What a showcase for the drama of mountain railroading! For exhibition purposes, this whole sequence could easily be automated, to provide continuing drama during the day. Note: there are no turnouts in this layout. The tracks shown inside the mountain are entries and exits for the central circular helix, which is used only by descending trains. One addition you might want to consider, if you’re building this layout, would be to add a passing siding on the helix, to accommodate a third train in the mix! The Closet Central is a small N-scale line I designed about 25 years ago, to fit into a tiny under-stair closet (cupboard) in the house where I lived. It measures just 42×36 in (105×90 cm) and is designed to be built at head height (roughly 60 inches or slightly higher). The door to the closet is located at the bottom of the drawing, so the plan was to open the door, duck under the layout, and put one’s head through the foot-wide opening in the center. There, the lone operator would be surrounded by his eye-level empire — a three-times-around short line from Albion, in the hills, to the concealed layover siding at Deptford. En route there’s switching at the industrial park in Cargoville, and the simulated interchange track at Beulah. A pleasant prospect for relaxed, short-line operation. Alas, I moved to another house before the Closet Central could be built. If you make a version of it, please send photos! 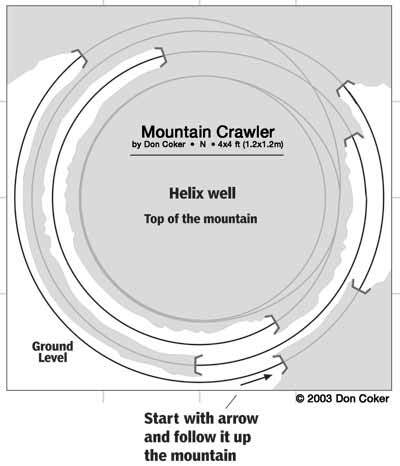 Don Coker, of Columbus, GA, please contact me concerning the Mountain Crawler layout. I am interested in incorporating that concept into a model On30 layout of the Tellico Lumber Company line with the addition of the helix at Copper Hill. Would love to discuss your layout further.